BMW is a popular well-respected worldwide brand. BMW manufactured convertibles for the 300 series models. 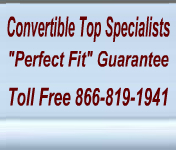 BMW convertibles are a prestigious and popular model for car enthusiasts. Each of our BMW convertible tops is manufactured to original pattern specifications and we offer the original fabric selection. Our BMW convertible tops will instantly renew your vehicle to show room condition. We offer a complete line of convertible tops, BMW convertible top straps, BMW convertible top cables and BMW convertible top headliners. Our convertible tops will fit the BMW 318 convertible, BMW 320 convertible, BMW 325 convertible, BMW 328 convertible and BMW Z3 convertible.